It’s time to keep your RSS feed under control and have an organized news feed! If you are just like me, who loves to optimize my access to the internet by cramming hordes of information into my brain, there are times when this can result to me getting confused and overloaded with unnecessary information. It starts to get overwhelming when I look into my RSS feed filled with so much “clutter”. So, I thought I need help organizing my news feed. The thing is, when we see a valuable news item online, we immediately click on that orange button and subscribe to a blog. However, over time, it’s either we lose interest on what’s being shared or the blog owner just suddenly seemed to be veering away from a particular topic that’s valuable to us. On some occasions, we’re getting more information than we can handle that it becomes a total waste not to be able to leverage on them. Like, we see hundred of posts about a particular topic, but we can’t process the information properly because it’ll take time to sort through those hundreds of blogs or articles. Just like your favorite car, your RSS feed also needs a tune-up and an overhaul from time to time. Fortunately, we have 3 powerful tips that are guaranteed to help jumpstart our intention of cleaning up the chaos in our feeds and start to get things organized! 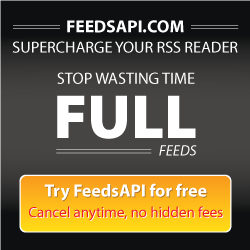 Get a smart RSS Feeder. Your RSS feed reader are like your virtual secretaries, catalogueing the content of each incoming feed according to your needs. Right after the untimely death of Google Reader, several applications that are also commendable have burgeoned just in time, and FeedsAPI is one of them! Filter by keywords, create tags and links, keep surplus feeds by secluding those in a separate folder, and maintain the framework of your feeds. Keep separate folders for each reading list. By prioritizing your feeds according to topic or categories, the time that is usually consumed in scrolling through your feeds searching for an update can be made shorter. Create a folder for your most loved sources. This way, all the news items from a specific source are gathered in a single place. Thus, even though you’re not able to access your feed for say a week or so, getting hold of valuable contents becomes easier. If you come across a feed that doesn’t satisfy you, get rid of it. As simple as that. No use holding on to something that’s not giving you value anymore. An organized RSS reading list is the bloodline for content creators and bloggers; a skill that is meant to be lived and died on. Remember to keep things organized for a better reading experience and to get the most out of your RSS feed!